U.S. President Donald Trump’s National Security Advisor John Bolton, while visiting Moscow this week, maintained his longtime criticism of the 1987 Intermediate-Range Nuclear Forces Treaty (INF), stressing that the agreement has outlived its usefulness and persistent Russian violations are fueling America’s decision to pull out. 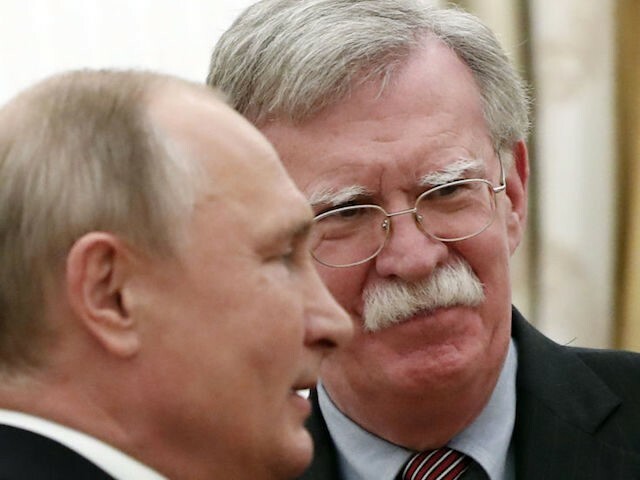 While speaking to reporters in Moscow, Bolton expressed support for the president’s decision, referencing the same arguments the president made last Saturday. “I think it’s important first to look at the reality that the treaty was outmoded, being violated, and being ignored by other countries. Under that view, exactly ONE country was constrained by the INF treaty: the United States,” Bolton declared. It’s a position Russia doesn’t agree with, but which we feel very strongly about. It was a major factor in our decision to withdraw. I might say for the context involved here, this is not a subject that arose yesterday. This question of Russian violations is long and deep and something that both the Trump and the Obama Administrations were very concerned about. Bolton pointed that the U.S. State Department has determined that Russia has failed to comply with the INF over the last five years. “It’s been the position of the United States for approximately five years that Russia was in violation of the INF treaty because of certain missiles that it was developing, producing and deploying,” he said. Bolton stood by an editorial he penned in 2011 in which he blasted the treaty, arguing that strategic threats such as China, Iran, and North Korea were not covered by the INF so it dangerously limited America’s options for combating with them. Countries like China, Iran, North Korea and others who are not covered by the treaty…are free to do whatever they want in the intermediate range and have made very substantial strides to have that capability. We estimate, for example, in the case of China, that somewhere between one third and one-half of all of their ballistic missile capability would violate the INF if they were a party to it. Bolton declared that there is a “zero chance” the Trump administration would reverse its decision to withdraw from the treaty. “If Russia were to dismantle all of its equipment in violation of the treaty and China did the same, that would be a different circumstance. I think there’s zero chance of that happening,” he said when asked what will it take for the U.S. to change its mind. “From our side, the response will be instant, and I want to warn, symmetrical,” Putin cautioned.